They are completed. Custom hanging system. Ready for travel to the final destination. The project is moving along nicely. This video will shed a little light on the process. Enjoy! Soon to be installed in Chicago. Enjoy. Painting is moving along very well. We have miles of paint left to go, but it sure is looking good. Thanks to FWPA for the support. Liberato by Gregory Beck detail. I will have more images of this work very soon. Stay Tuned. It was a beautiful day for the dedication of the East Lancaster Traffic Control Cabinets Public Art Project. We had a great crowd of Artists, Fort Worth Public Art Representatives, City Council Members, Police Dept. and Community members. 12 locations along E. Lancaster Ave. have been vinyl wrapped in as many Artist's styles. Take the time to travel the avenue and see the art. I am proud to be a part of the dynamic Public Art scene in this wonderful City. Gregory's painting Summer Serenade was licensed by the FWPA to decorate the Traffic Control Cabinet located at E. Lancaster Ave.
Dave Parnell of Signature Graphics installs Summer Serenade, a painting by Gregory Beck, selected by The Arts Council of Fort Worth and Tarrant County as one of the designs to be licensed for wrapping the traffic signal control cabinets along East Lancaster Avenue. Various artist's work has been chosen for this city enhancement program. Fort Worth Public Art Project - Fabrication has started! East Division Police Station Public Art Project - First phase of fabrication for my 80' foot long mural. Water-Jet cutting the materials. A long way to go, but happy to be starting actual production. Stay tuned for more updates as they happen. Thank you Jim & Jeff at Alternative Cutting Methods, Inc. in Fort Worth for a very professionally produced product. And, a special thanks to FWPA for the support in helping this become a reality. 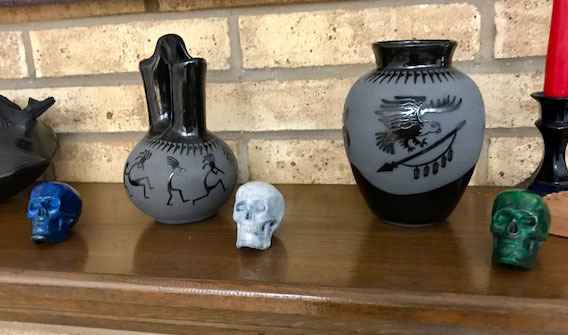 It’s fun to see collectors John & Vicki enjoying a trio of my ‘Das Endergebnis’ skulls. I appreciate you sending the image! Thanks to you both for your friendship and support of my artwork over the years. All my best, GRB. Getting in some last minute finishing touches on the Liberato Life-Size sculptures. Then off to mold making. 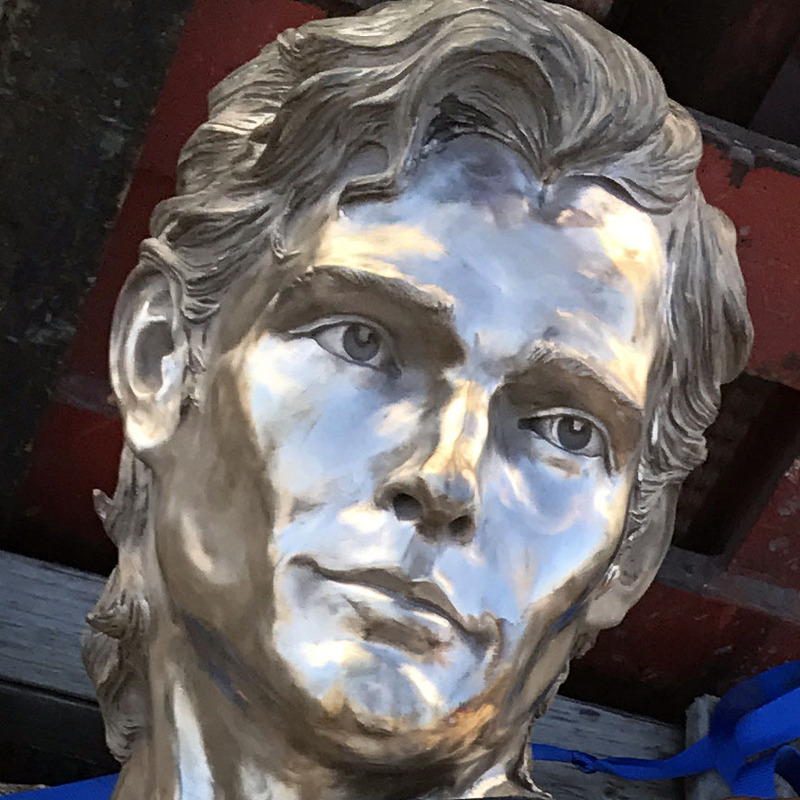 The first pair of finished cast bronze sculptures will be installed at the entryway of a private art museum in Chicago. Pre-orders for this limited edition of 6 can be made by emailing us via the Contact page at www.ArtbyGregoryBeck.com. Wall-hung or free standing installations can be arranged. Empowering yourself to emerge into an enlightened spiritual life by consciously liberating your mind from the past, is the inspiration for Beck’s “Liberato” sculptures. Female: “Donna Liberata” (Liberated Woman) 8’ H x 35” W x 36.5” D. Male: “Uomo Liberato” (Liberated Man) 8’-6" H x 35” W x 38” D. Both to be produced in Cast Bronze, Limited Edition of 6. Available individually or as a set. For pre-ordering information, please contact us via the Contact Page. For more studio images click HERE! 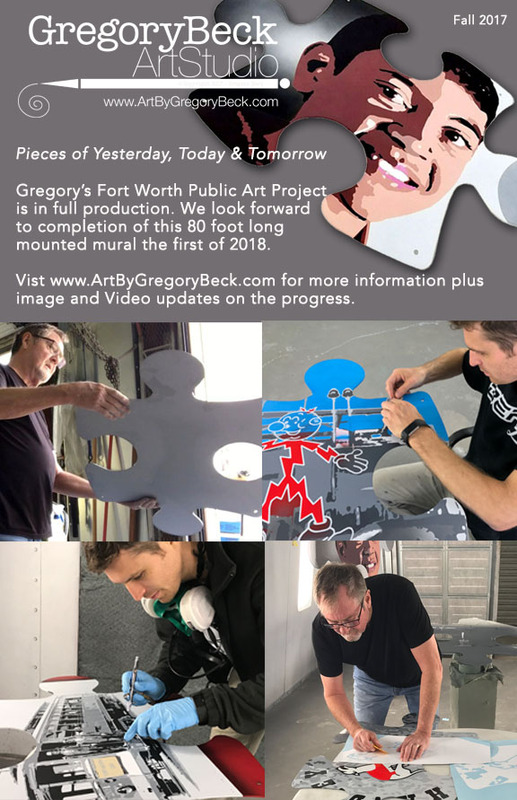 February 13,2017 - Fort Worth, TX - The Fort Worth Public Art Council unanimously approved Gregory Beck's design Pieces of the Past, Present & Future for the East Lancaster Police Department exterior wall mural. The project is an extension of artist Jack Mackie’s Public Art Master Plan for the East Lancaster Corridor (2009); which recommended artwork at the Fort Worth Police Department’s East Division Police Station as part of the City's ongoing efforts to artistically enhance our great City. Fabrication will begin upon completion of the final contractual agreements and we look forward to creating this intricately illustrated salute to the history and diverse culture of East Fort Worth. Following multiple community meetings, gathering input from the enthusiastic and dedicated community including local historians, photographers, City Council representatives, the police department and area supporters we have assembled a great collection of images that represent the Past, Present and Future of this vital Fort Worth area. My thanks goes out to the Arts Council for their professional and caring approach to developing this idea from a vision to a soon-to-be-realized installation. Partial graphic detail of the mural in progress. Original photo taken and use permission by Lloyd Jones Photography. I don’t mention my collectors in public media often. I respect their rights to privacy, security and anonymity, but it is their wonderful comments about and willingness to purchase my artwork that inspires me to continue to create. Today I want to express my thanks to my major collectors Dan & Teresa, Johnny & Lucille, Dr. Sam, Dr. Q. Mark, John & Vicki, Walter E., Mike C., Dr. Lon & Linda, Chuck & Patti and the hundreds of loyal art buyers for your support over the years. Also, I want to thank my New International Collectors, Michel & Anne, and family for acquiring Veiled Allusions and Rendezvous. I know these pieces will enjoy the fantastic view of the St. Lawrence River! Great Turn out today for the release party of the first Fort Worth Public Arts Commissioned Works catalog 2001 - 2015. Mayor Betsy Price announced the release of the new catalog at this well attended and fun event celebrating 15 years of the Fort Worth Public Art Program. The Arts Council of Fort Worth and Tarrant County has selected Summer Serenade, a painting by Gregory Beck, as one of the designs to be licensed for wrapping the traffic signal control cabinets along East Lancaster Avenue. Various artist's work has been chosen for this city enhancement program. Summer Serenade - Acrylic on canvas, 36" x 40" by Gregory Beck.